Is there anything better than a perfectly ripe, juicy peach? While all fruits and veggies taste best in season you can still get by with broccoli or bananas that have been shipped in from other parts of the country (or world) in the off season. Not so with peaches. I submit that the perfect, tree ripened, local peach is one of the best things on earth. My dad gave me 6 gorgeous peaches when I was visiting Kansas City a week or so ago. If you thought peaches were just the property of the folks in Georgia, you were wrong. Missouri grows some great peaches. Apples too. I bootlegged my peaches back to Florida (through Georgia…I know, I know) and had to find something spectacular and deserving of their beauty. 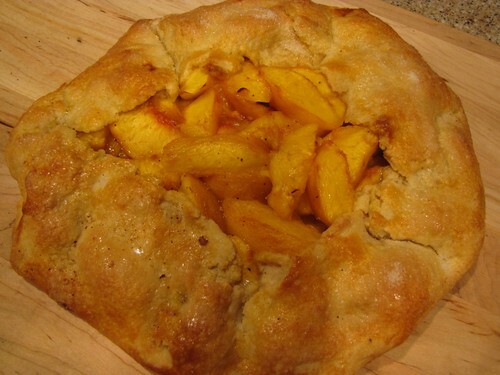 This Rustic Peach Tart is everything I had hoped it would be. I actually cheered when it came out of the oven. It smelled that good. 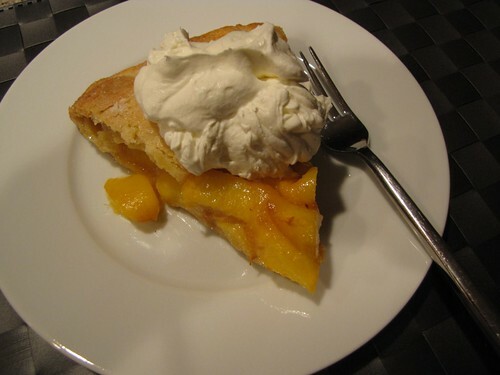 You do need to plan ahead to make this dessert as both the peaches and the crust need to sit 1 hour before you make them into the tart. If I’m just eating a peach, I leave the skin on…the fuzz doesn’t bother me one bit. 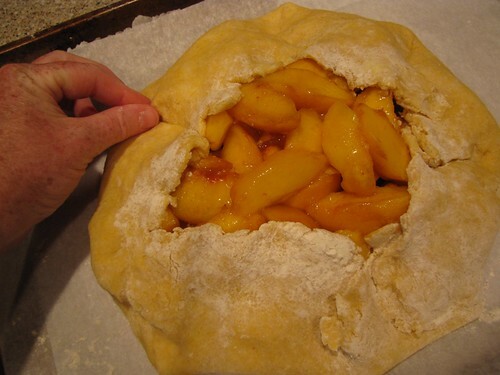 However, when baking, I like to remove the skin otherwise it will remove itself when the peaches get hot and float oddly around on top of your tart. 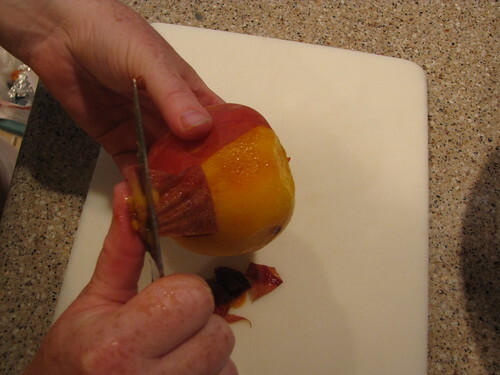 Skinning peaches (and tomatoes) is quite easy. 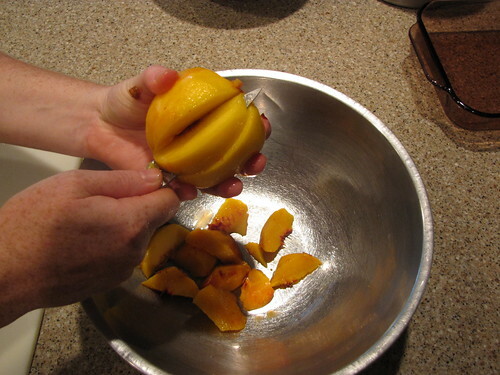 Slice a small X into the top of each peach with a small knife and pour boiling water over them to scald the skin. Be careful not to scald yourself in the process. 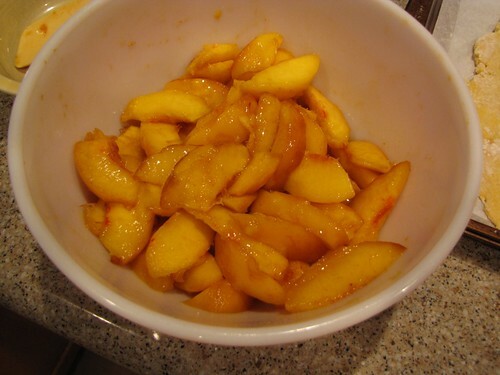 Let the peaches sit for about 5 minutes then you should be able to peel the skin off by starting at the X you marked in the top of each peach. 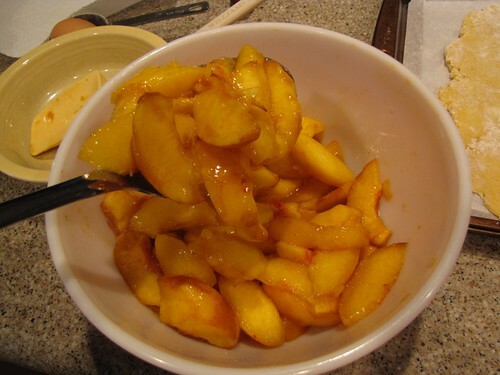 You can cut the peaches into wedges and cut them away from the pit at the same time. 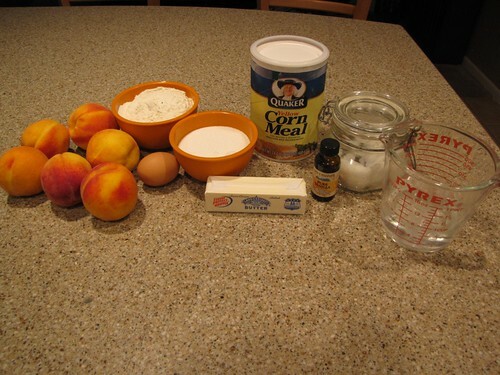 I am using 6 medium sized peaches for this tart. 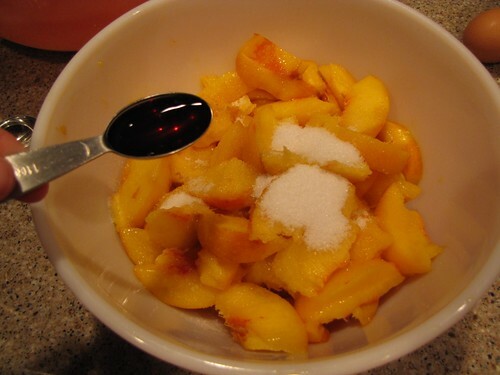 When your peaches are all skinned and cut up into a bowl, add 2 Tablespoons of sugar and 1 teaspoon of vanilla. Toss the fruit gently to combine and allow it to sit for 1 hour so that the fruit can macerate or make juice. 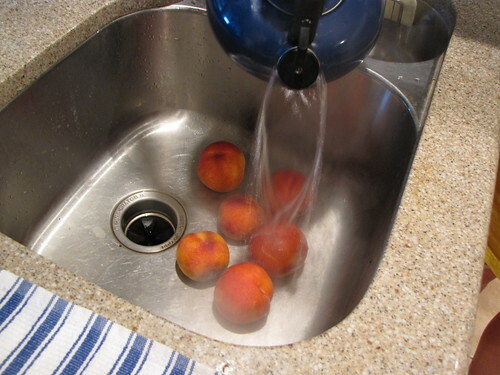 If you live in Florida, cover your bowl with a plate so you don’t have a fruit fly party while the peaches macerate. 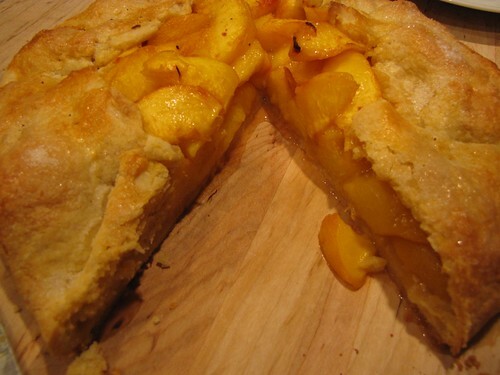 The crust also needs 1 hour to chill, so plan to make it ahead at the same time you prepare the peaches. 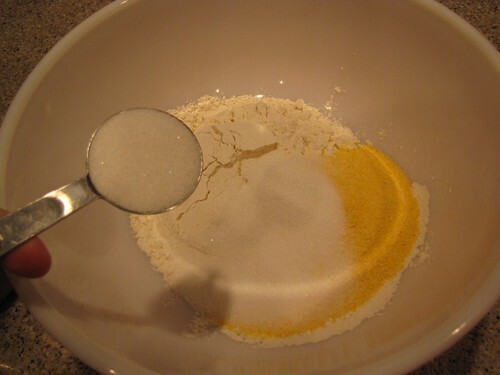 In a large bowl, combine 1 1/3 cups flour, 1/3 cup yellow cornmeal, 3 Tablespoons sugar, and 1/4 teaspoon salt. 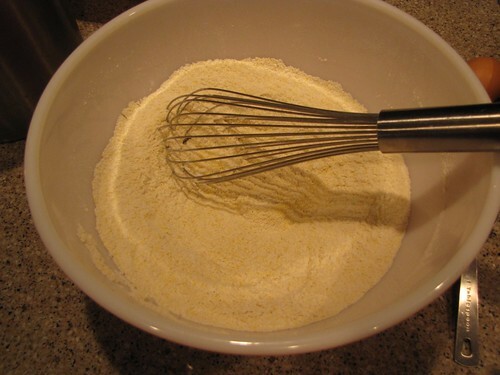 Whisk to combine the dry ingredients. The cornmeal is the secret ingredient to this fantastic crust. 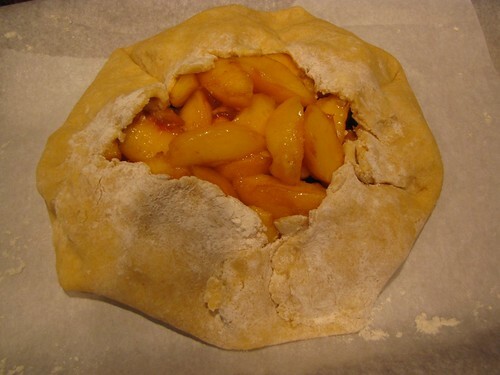 It adds a little more body and crunch than a traditional pastry crust. 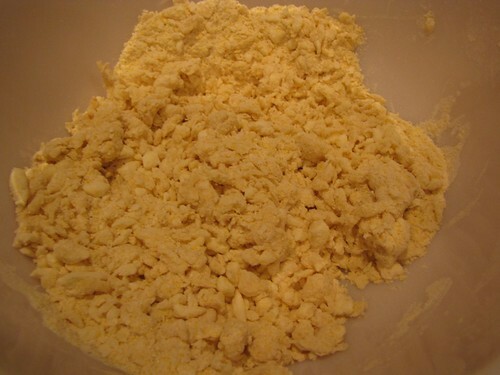 Cut 1 stick (8 Tablespoons) of COLD butter into cubes and add it to the flour mixture. 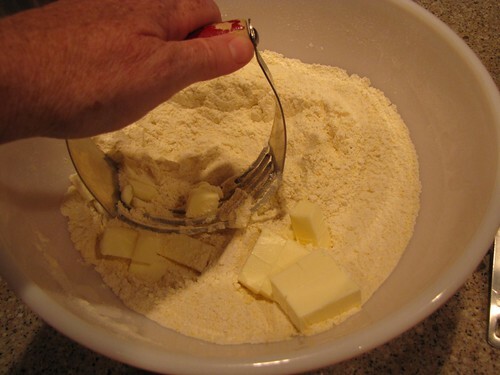 Using a pastry blender, 2 forks, or your fingers, “cut” or work the butter into the flour until you have small, pea-sized bits of butter. It’s important to do this fairly quickly so that the butter stays cold. Cold butter = flakey crust. 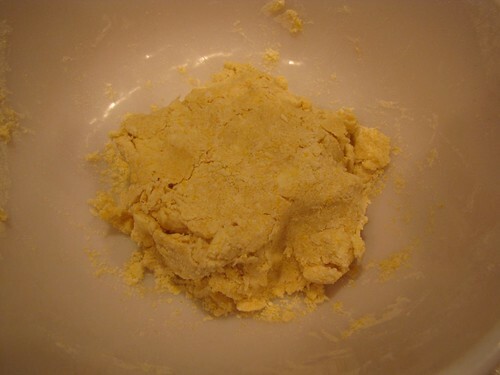 Pour 1/4 cup of ice water into the bowl and stir it into the flour/butter with a fork. Note: I like to fill a large measuring cup with ice & water as shown in the ingredient picture so it gets nice and cold. 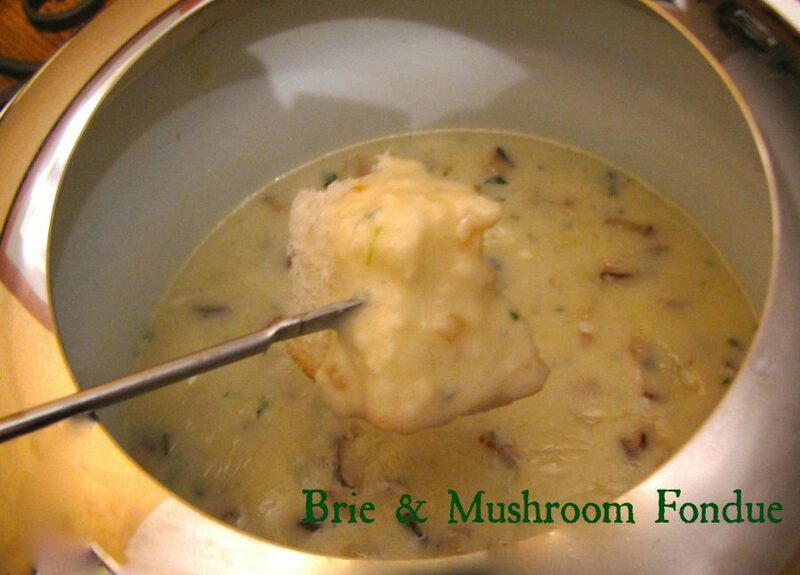 Then you can measure out 1/4 cup of ice water into a smaller measuring cup and add it to your dough mixture. 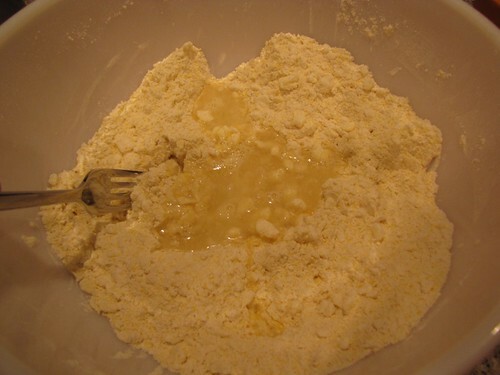 After stirring 1/4 cup of water into the dough, the flour should be starting to get moist. 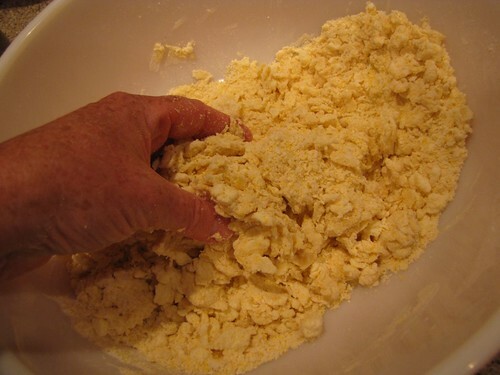 If it is still too crumbly to hold together (as shown here), add more water 1 Tablespoon at a time, up to 2 additional Tablespoons of water. The dough will still be shaggy, but shouldn’t be too dry. I ended up using the full 1/4 cup water + 2 Tablespoons of water for my dough. 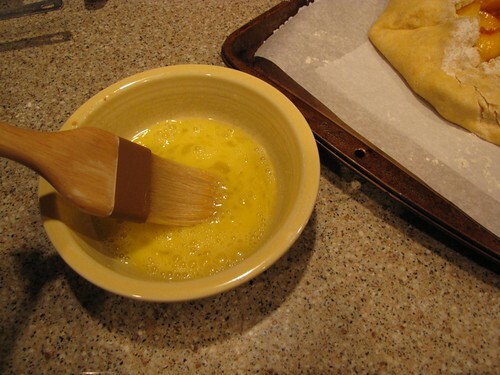 Knead the dough together with your hands in the bowl 4-6 times until it holds together. Don’t over work the dough. 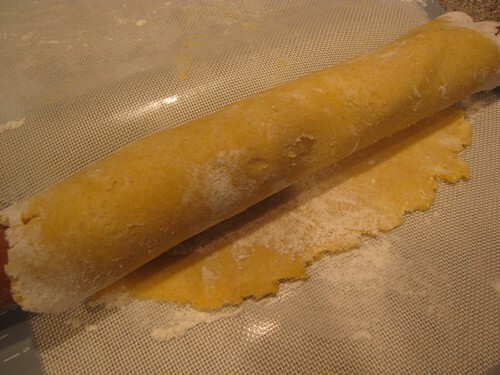 This is not a dough that will form a tight ball like bread or pizza dough. It should look a little rough and crumbly. 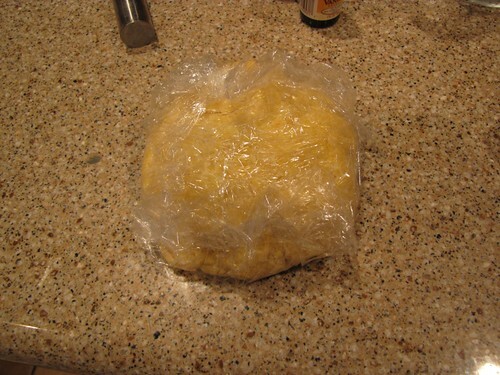 Cover the dough in plastic wrap and refrigerate for 1 hour. 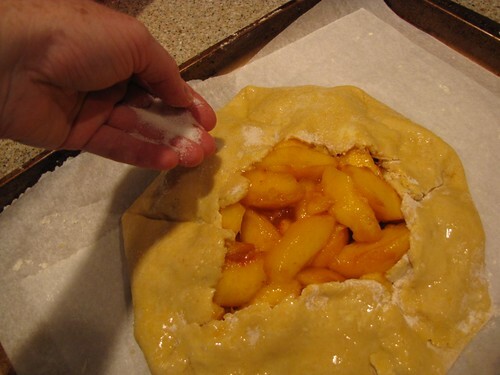 When you are ready to prepare the tart, take the dough out of the refrigerator for 10 minutes to take some of the chill off and make it is easier to work with. 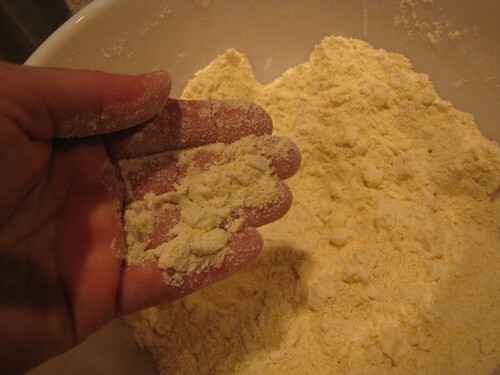 Lightly flour a your work surface (clean kitchen counter) or baking mat. 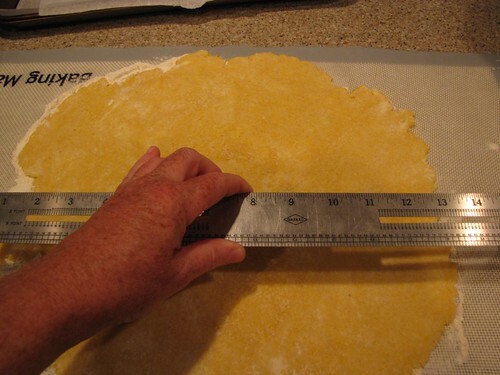 Roll out the dough into a 12 inch circle. My baking mat has a ruler built in. When in doubt, grab one from the desk and be like Martha and measure. 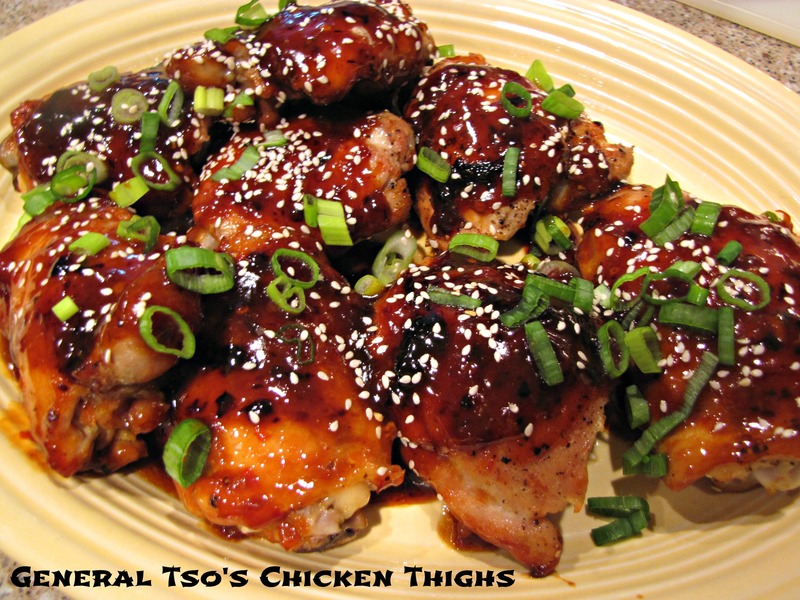 Line a large baking sheet with parchment paper or a Silpat baking liner. 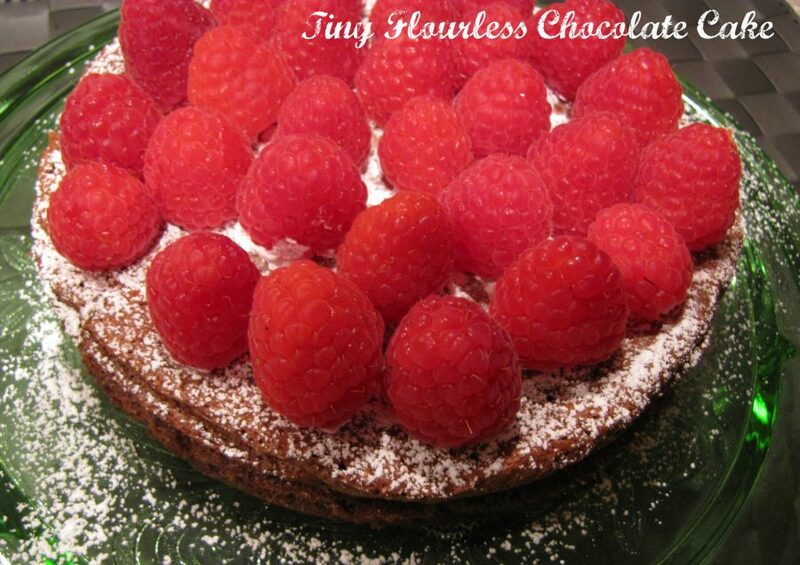 Be sure to use some sort of liner or your tart will stick. 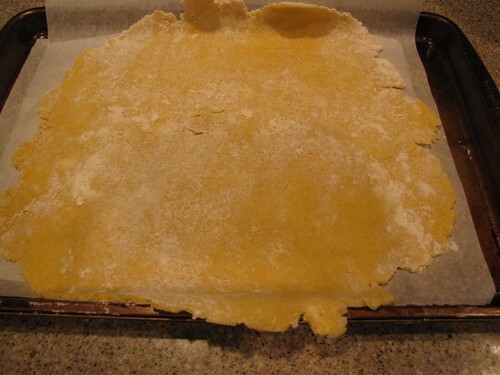 and transfer it to the parchment lined baking sheet. Don’t worry if it hangs over the edges, we will fix that. Go admire your peaches in all their juicy goodness. Try not to eat them all before they go into the tart. Use a slotted spoon to remove the peaches from the juice (SAVE the juice!) and pile them up in the middle of the crust. 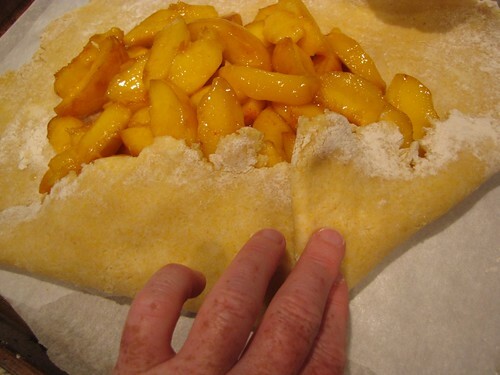 Gently fold the edges of the crust up over the peaches, overlapping as necessary. Gently press the seams together to seal the edges. Pour the juices over the top of the peaches. 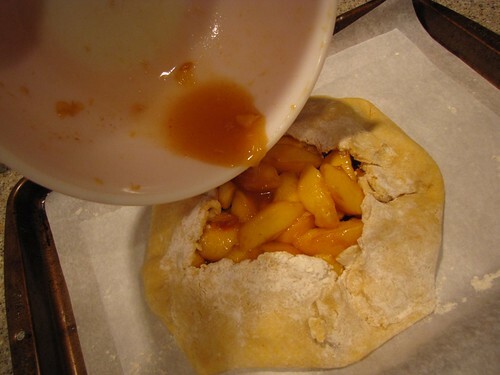 Do this step last otherwise your crust will become a soggy, leaky mess. Gently beat 1 egg with fork combining the white and yolk to make an egg wash.
Lightly brush the egg wash over the top of the crust. You will have more egg than you need…just discard the excess once you have a light coating on the crust. 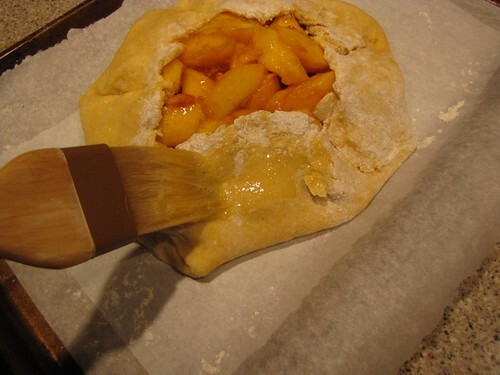 Sprinkle the top of the crust with a little sugar to give it a nice finish. Bake at 425 degrees on the middle rack of the oven, 25-30 minutes until golden brown, bubbly, and lovely. 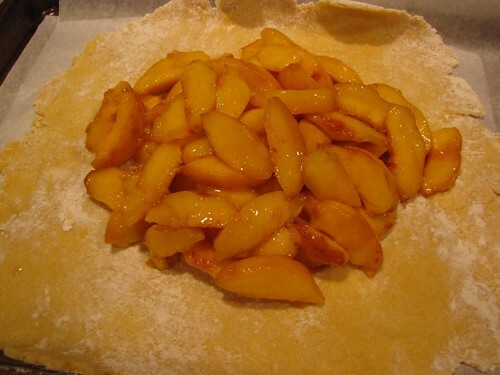 Remove the tart from the oven and allow it to cool and set up for 5 minutes. with a dollop of whipped cream or scoop of vanilla ice cream. Eat and be very happy that it is summer. Guess who has peaches, right now, this is going to happen here. 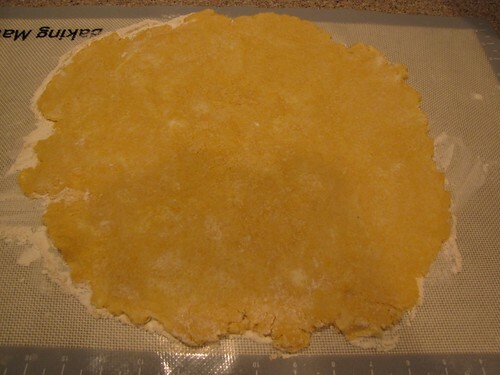 I like to toss my pie crust in the freezer if I am in a hurry. But if I am really planning, I will make it a day ahead. Don’t laugh, it has happened. 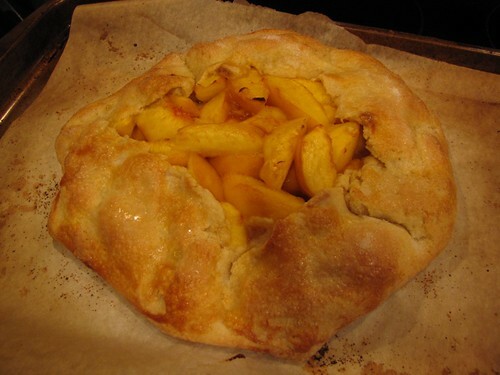 I like the idea of the cornmeal in the crust. I’ve been on a fruit crisp jag this summer. ( I keep crumble topping in the freezer.) Thanks for the tart reminder. (groan) I wonder if this could work on the grill? I never knew how to skin a peach. (or mater) So cool. 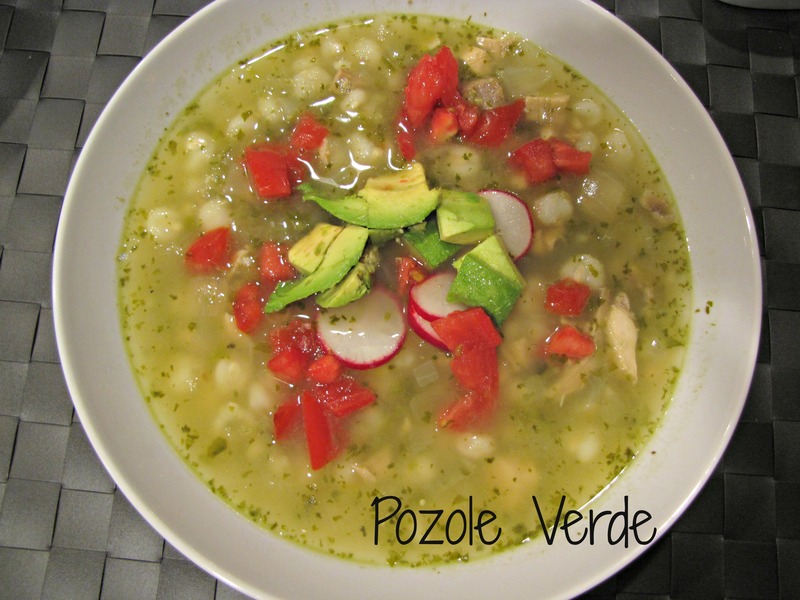 This looks delish Claudia….as always.